Craft Supplies to Carry You Through the Year! 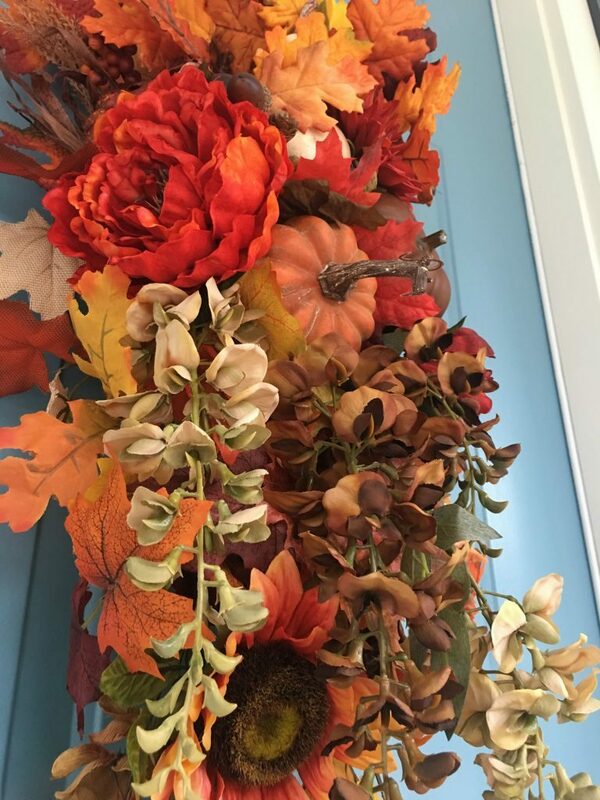 I have been so busy getting ready for the coming holidays and the fall season with so many crafts ahead of me! It was time to take a look at all of my craft supplies and order in what I will need to use through the end of the year. This is the busiest time of year for this crafter! 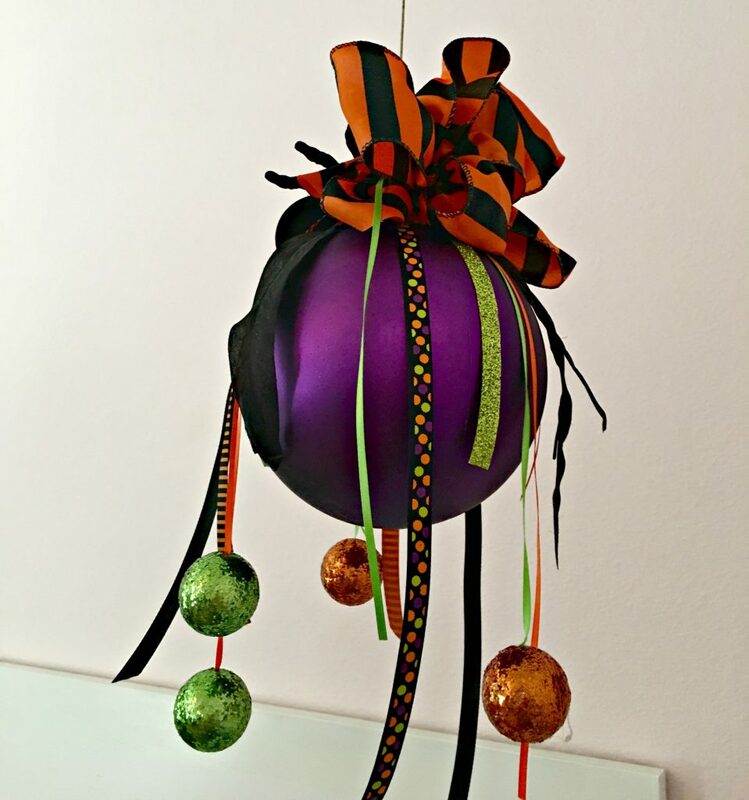 Fall, Halloween and especially Christmas offer so many opportunities for creating my own decorations. I want to be totally prepared so I am not having to run out for this or that, so I sat down with my computer and opened up Amazon! 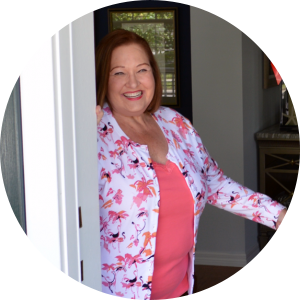 I get so many questions about the items I use to make my door swags and other creations. Today I am hoping to answer all of those questions and provide links so you can build up your own craft supplies! If you watch my LIVE videos on Facebook, you may have noticed me using my Stemming Machine. 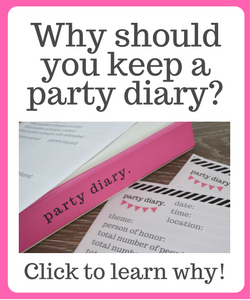 This is a great tool if you make things for an Etsy shop or selling at craft shows. If you are only making things for your personal enjoyment, this might not be worth the price tag. Of course if you buy a pick or stemming machine, you will need steel picks to use with it! I used my steel pick machine to make my Fall Door Swag. One of the items I get the most questions on is what I call “s” pins. These are also called greening pins or floral pins. 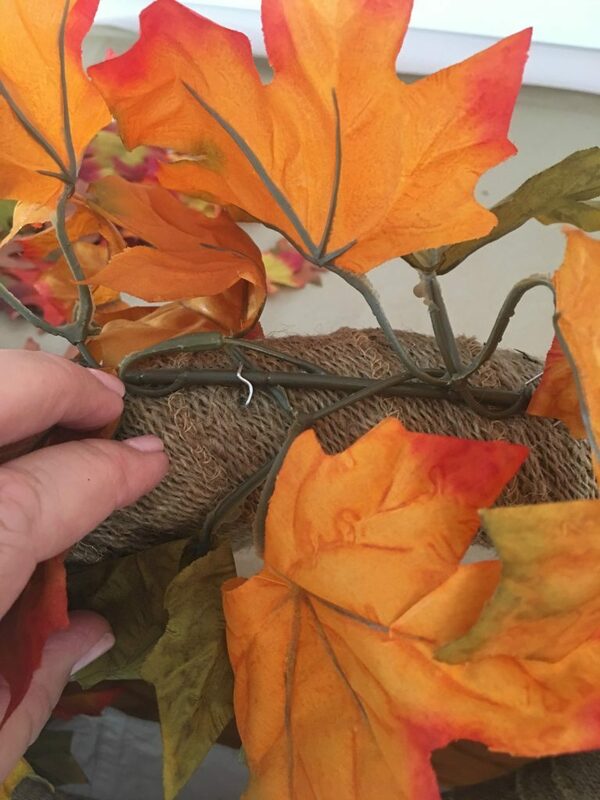 I like to use these when attaching a leafy or floral garland to a styrofoam or straw wreath form like I did in my Falling Leaves hanging “chandelier”. You will see me using these in a variety of ways when creating my different projects. Glue, glue, glue! 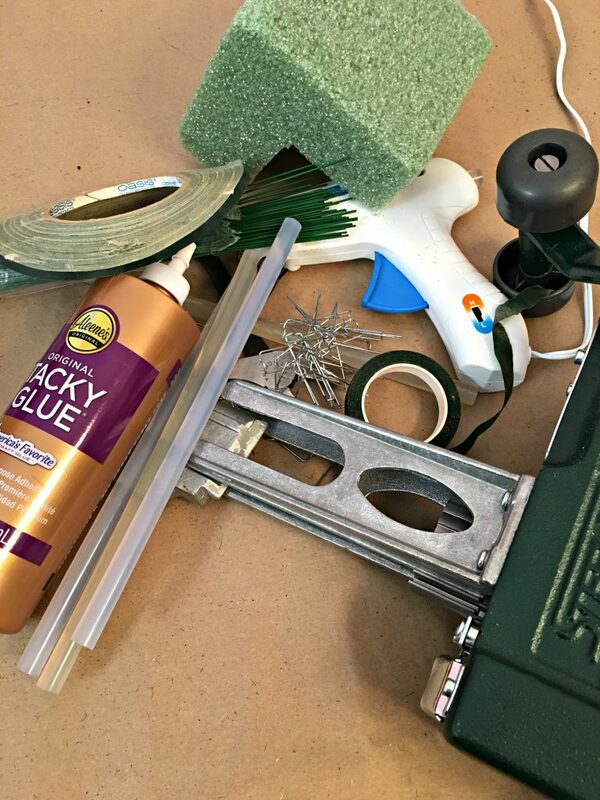 Glue guns, glue pots, you name it, there is no way you can get creative without glue. I used my glue gun to create these adorable Halloween ornaments.I have been using a corded glue gun, but I have decided to treat myself to one of these battery operated Ryobi glue guns to see me through the rest of the year. I will let you know how I like it as I begin working with it. Whichever one of these you select, make sure you have lots of glue on hand! I like using the ten inch glue sticks so I don’t have to keep refilling my gun as often. I don’t use a glue pot often, but I do on occasion, (like that day I was LIVE on Facebook and my glue gun died)! If you want to try a glue pot, buy the glue pieces made for it, don’t use the sticks that are made for your glue gun. 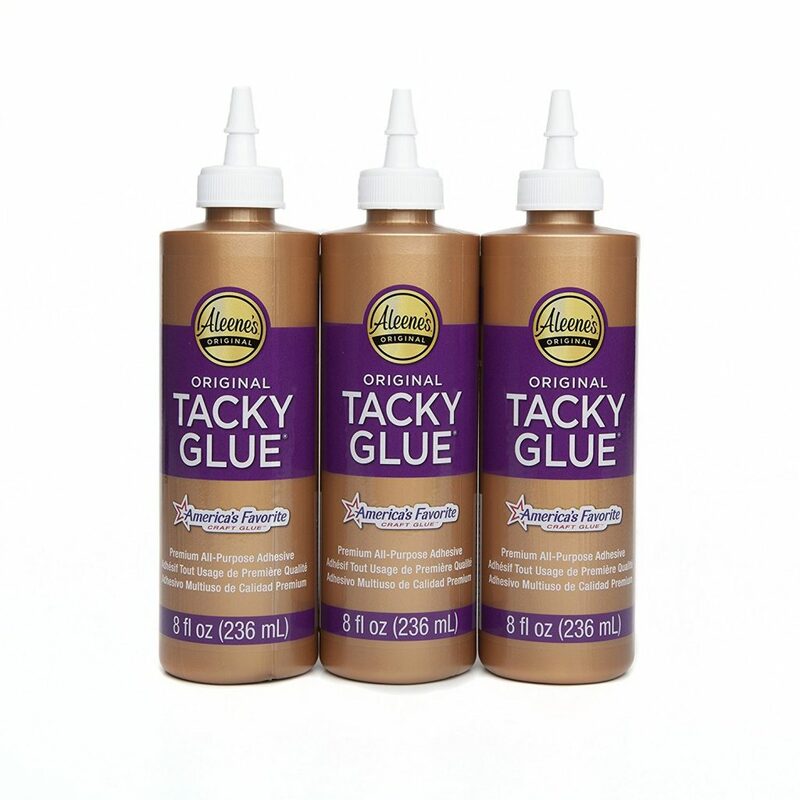 It never hurts to have some of Aleene’s Original Tacky glue on hand, either! I used this to add the ribbon to the back of my swags. 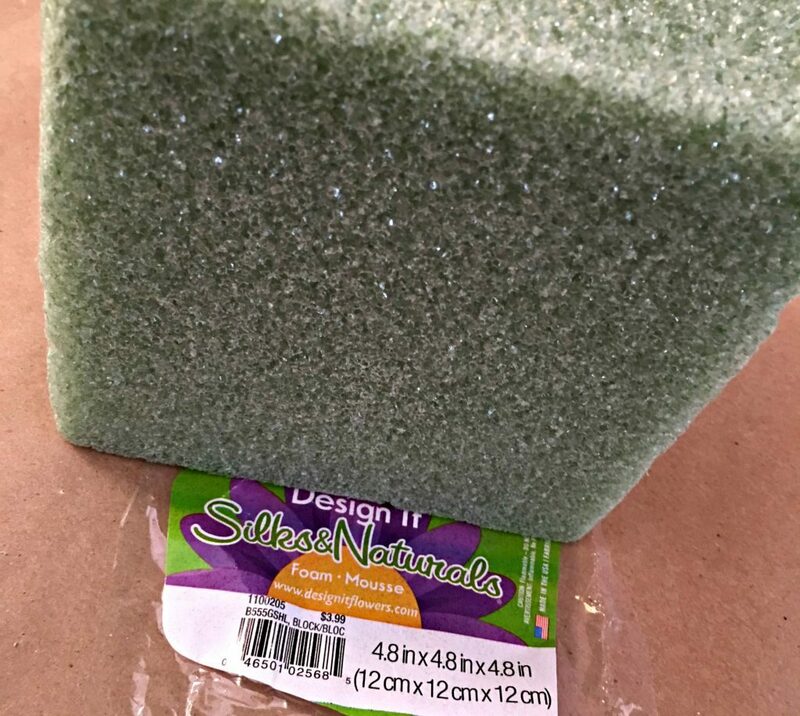 When you want to glue something to styrofoam, it is a great alternative to hot glue which tends to melt the styrofoam. While we are talking about glue, I use a variety of the Gorilla Glue products depending upon the project! 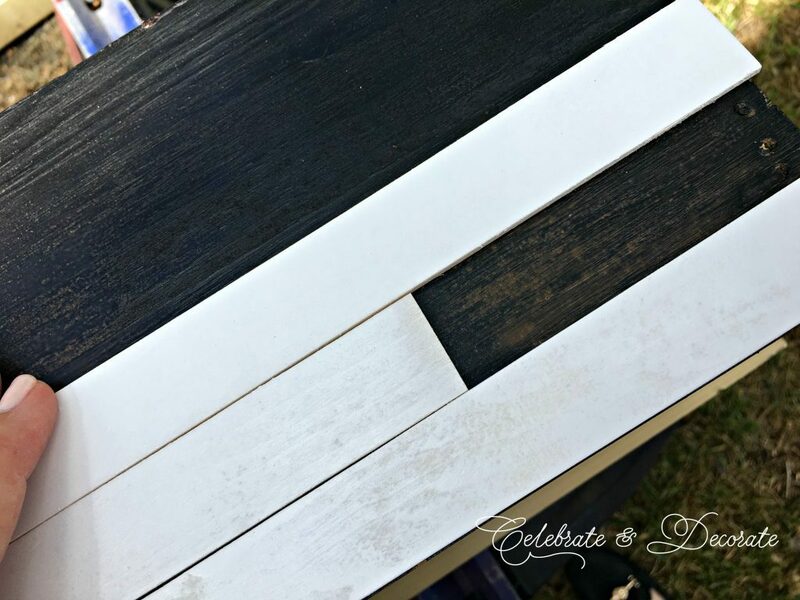 I used their wood glue when I was making my faux shiplap planter! 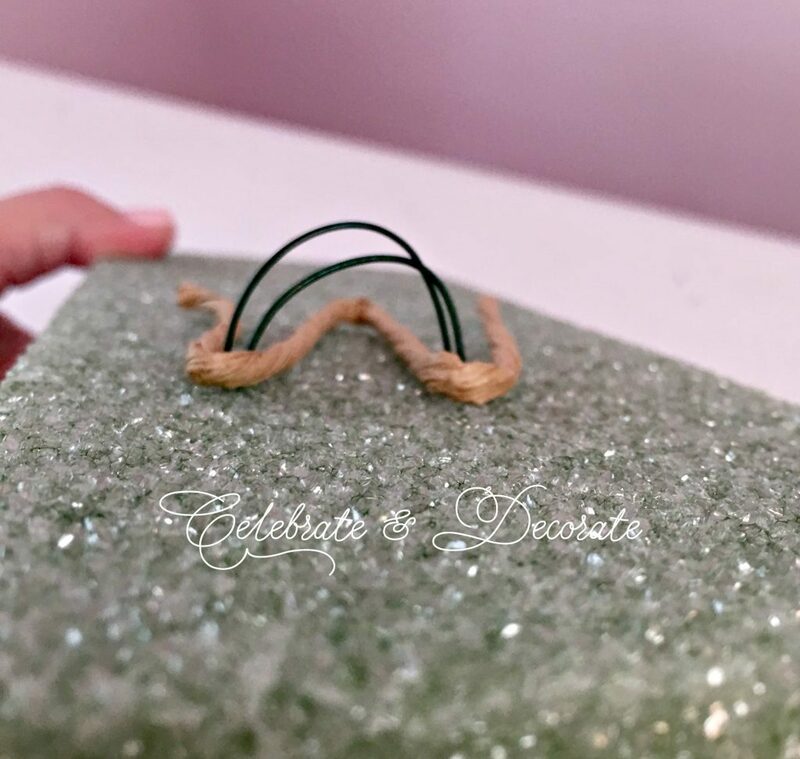 Floral wire is one of the things I really can’t live without in my craft room. If you haven’t seen it, the photo below is one of the steps I use to make a hook for a door swag. This one was for my fun Halloween Swag. The gauge of the wire corresponds to the thickness of it. 16 or 18 gauge is the heaviest I ever work with and 26 is the lightest. I use both plain wire and paper wrapped which you can see in the photo above. If you are stocking your craft supplies you might want to order in a variety of gauges so you are comfortable with the different kinds for different uses. Of course if you are going to use wire, you need a good pair of wire cutters. Make sure they have the spring in them and keep them sharp. If they lose their ability to cut through those thick faux floral stems, it is time for some new ones or to have yours sharpened. Floral foam and styrofoam are great to have on hand. I also do a fair amount of fresh flower arranging so I like to keep fresh flower Oasis on hand also. These things are often less expensive when buying in bulk and keeping a supply on hand. I hate to be ready to do a project and realize I am out of one of these. I hope this list and these easy to shop at links will give you a starting point for all of your basic craft supplies! Of course you will want to get your apps on your phone and your coupons out and head out to the craft stores to get the fun stuff! You know, the silk flowers, the picks and ornaments, and all that goes along with it! If you have any questions, feel free to message me or comment below! I love hearing from my readers! Happy crafting! Oh, yes, Jenna, I have discovered being LIVE on Facebook! It is like crafting with a bunch of friends! I am supposed to fly out on Saturday, but if I can’t get out, I am stocked up! My home is block construction, so I should be good! Thanks for the prayers though! Depends what I am making. If it is fresh flowers, I must use the wet (brand name: Oasis). I use both the dry (brand name: Sahara) and I use Styrofoam. If I am making a swag or something that hangs on the wall like that, or filling a pot on my front porch where it gets a lot of wind, I like to use the Styrofoam. 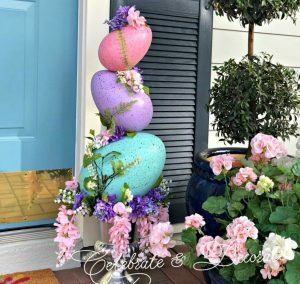 If I am making an arrangement with faux florals in a container for in the house I use the Sahara foam, which is easier to push things into, but will also break apart easier than Styrofoam. I hope that answers your question! Thanks for stopping by Celebrate & Decorate! Thanks for creating this list, I need to pick up some of these items! Praying you stay safe! You are welcome, and thank you Pam! I am praying for everyone in south Florida, too! Thank you so much Amanda! All who watch, like you, are what inspires me! I will be safe! Strange as this sounds I have everything on the list except for the stemming machine and steel picks. I think once upon a time I was convinced that I would tackle lots of floral arrangements and crafts. Never say never, these supplies might come in handy one day! Sounds like you need to get to work! 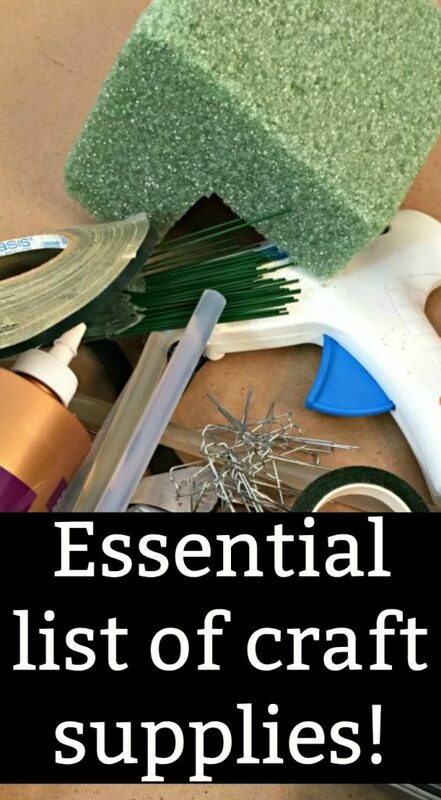 I am a beginner but tend to “stock up” supplies and tools when starting a new craft. 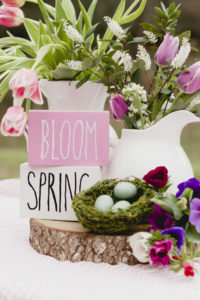 I would be interested in your storage ideas for keeping everything organized and safe from dust, dirt, etc., for both tools and supplies including flowers, picks, and ornaments. TIA for your response. I should do that Elaine…that would have you assuming I am doing a good job organizing and storing myself. I will put some thought into this and get back to you! Any ideas yet ref organizing and storing the supplies – especially the stems and garlands, etc. Thinking of using a toolbox for the tools so they are all in one place and won’t be used for other uses and go missing 🙂 But have no idea what to do about the long stems, flowers, etc. Oh my, Elaine, I wish I could say I was really organized and had everything tidy! I have a lot of clear plastic boxes (those really big ones) so I can see what is in them and then I have them stacked in closets all over the house! I do have a big 5 gallon bucket sitting in the corner of my craft room with some of my taller stems in it. Good luck on that organizing! Thank you for your response. It does help and gave me some ideas. Thanks so much for the shopping list . Have some of the items ,will shopping for the rest . Would like to get a glue gun stand ..where can I purchase that . 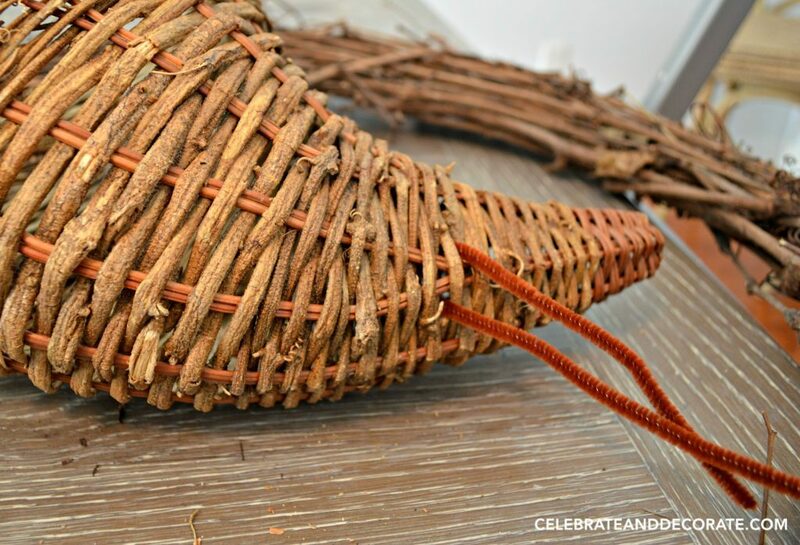 What wire cutters do you use that will cut through heavy decorative stems? I don’t have a brand name, but I have a good pair. I also find that sometimes I need to really work at some of the thicker stems.